The CSU Tennis Camp explores the game of tennis and the fundamentals needed to be a successful player, whether you are a beginner or advanced player. Instruction covers the fundamentals, and combines games, drills and workouts with the ball machine. We will work on the backhand and forehand swings, and the serve. Campers will meet at the CSU Mary Blackmon Tennis Center. For more information call 706.565.4331. 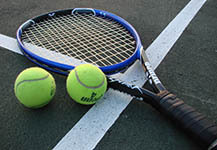 Please read: Campers must bring their own tennis racquet.